Bright and cheerful with stunning views from each room, Dragonfly is the perfect place to relax and enjoy peace and quiet with family and friends. 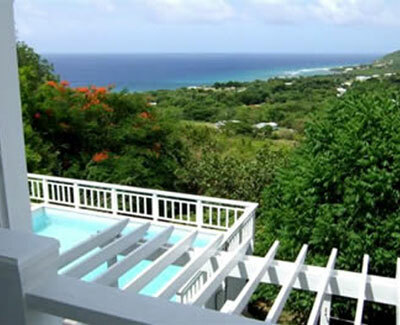 A short drive to world class diving, golf, restaurants, and St. Croix's famous beach bars. The lush landscaping surrounding the hillside Villa provides privacy and includes colorful tropical flowers as well as banana and mango trees. Dragonfly is set apart by the custom interior wall faux and paintings done by a local artist. Dragonfly boasts 2 air-conditioned Master Suites with bath, 2 bedrooms sharing a large bath, and a 2 bedroom air-conditioned apartment at pool level. Dragonfly also has an office area complete with fax, a great eat-in kitchen, as well as indoor and outdoor dining areas, media room with Cable TV and VCR, porches, balconies and galleries with outstanding views of the sparkling blue Caribbean sea and beautiful north shore coastline.